Vietnam and India share high potential of cooperation in pharmaceuticals, medical equipment and services, stated Parvathaneni Harish, Indian Ambassador to Vietnam during a Vietnam-India conference and business exchange in HCM City on August 3. 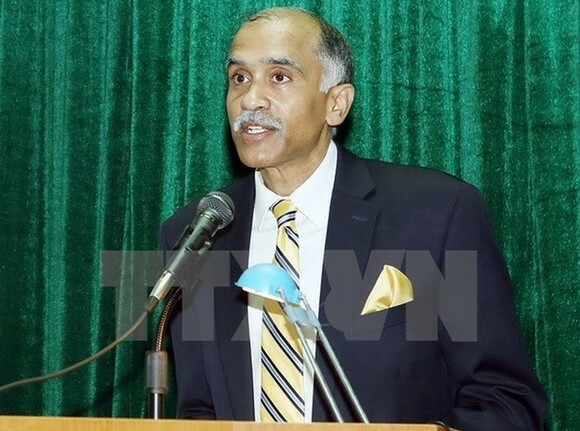 The diplomat said that since Vietnam and India elevated their ties to comprehensive strategic partnership in 2016, bilateral collaboration in trade and investment has been strengthened considerably. In the coming time, the two governments will prioritise the development of cooperation in pharmaceuticals, he said. The ambassador highlighted that India is the world’s biggest generic medicine suppliers, meeting over 50 percent of the demands for vaccines of different kinds. In 2017, Indian medical sector’s value was 33 billion USD, he said, adding that this will reach 55 billion USD, with an export revenue of 20 billion USD. India is now the world’s third largest medicine producer as the country provides about 10 percent of tje total medicine in the world. At the same time, the country has a large number of scientists and researchers in the pharmaceutical sector, said the diplomat, adding that strong growth of the health care sector has also led to the development of supporting services and medical equipment in the country. Raghuveer Kini, Executive Director of the Pharmaceuticals Export Promotion Council of India, said that medical equipment has become an emerging sector of India. The sector’s market is estimated to reach 11 billion USD in 2022. Made-in-India equipment has been exported to over 150 countries, including Vietnam. He said that Vietnam is an important market of India’s pharmaceuticals, medical equipment and health care in the ASEAN. The Pharmaceuticals Export Promotion Council of India has encouraged Indian enterprises to strengthen investment in Vietnam as well as trade with the country, he added. Truong Hung, Vice President of the Ho Chi Minh City Medical Equipment Association, held that the current demand for pharmaceuticals and medical equipment in Vietnam is high. Vietnam has to import 95 percent of its medical equipment, he noted, pointing out that the country spent 816 million USD on the products in 2017, and the figure expands 15 percent every year. The Vietnamese Government aims to ensure the supply of 60 percent of domestic demand in the future, which is a good chance for foreign investors, including those from India, he said. Hung noted that Vietnam’s pharmaceutical sector is now worth 3.5 billion USD, becoming a promising industry. India is now the second largest pharmaceuticals suppliers of Vietnam, a country that imported 70 million USD worth of medicine from India in 2017 and 80 million USD in 2018 approximately.